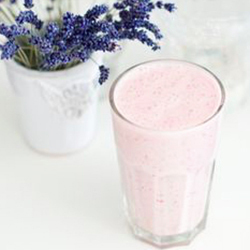 Fresh lavender is great in teas, mixed into butter or honey, used with bath salts and as I have recently discovered, a great addition to my morning smoothie. We enlisted a local organic farmer in our area, Farmer Jay, to come and build us a couple of home garden boxes made from cedar in order that we can grow fresh herbs. Along with the usual herbs like peppermint, spearmint, and lemon balm, he planted some fresh lavender as well, and taught me how to harvest it and use it in my kitchen. I was immediately hooked on adding lavender to everything. Living in South Florida allows for me to keep lavender growing outside all year. If you live in an area not suitable to grow plants outside all year, order a lavender plant to keep inside your home and reap the benefits throughout the year.